Complex adaptive systems exists at different scales, both spatial and temporal. As Lance Gunderson and Crawford Holling described it, those different scales form of structure of nested adaptive cycles. To make this idea a bit more tangible, let’s take weather and climate: we are all exposed to the very local patterns every minute we are outdoors; we take into account the regional patterns as we look at the weather forecast; and we are concerned over changes in the global patterns that could affect us locally. We are aware of the spatial scales, and with them we have a feeling for the temporal scales as well, ranging from seconds and minutes, to days and weeks, to seasons and years, to multi-year cycles like El Niño, to long-term developments like climate change or even ice ages. For example, a tornado is a fairly local event, but it is created and shaped by the regional circumstances, and the likelihood for tornados to occur is affected by changes in the global patterns. Within this nested structure, the bigger adaptive cycles turn slowly, while the smaller cycles turn faster. However, they are not synchronised like a giant clockwork. Rather, there are many potential ways the cycles to interact. Gunderson and Holling stress two types of interactions as significant, which describe the potential connections between the front–loop of a larger cycle with the back–loop of a smaller cycle. They dubbed those two interactions “remember” and “revolt“. 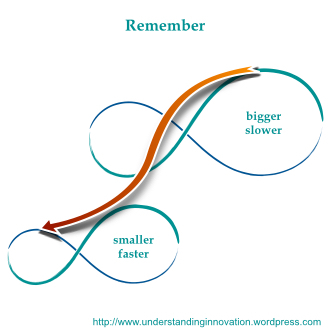 “Remember” describes a situation after the collapse in the smaller cycle, which passed through the release phase into the reorganisation phase. Here, the opportunities and the constraints for renewal can be strongly influenced by the next larger, slower cycle. The smaller cycle can draw upon the legacy potential and accumulated resources (knowledge, wisdom) of the larger cycle. In this situation, the larger cycle stabilises the smaller cycle, it “reminds” the smaller cycle of how things worked before. You might say that the bigger cycle offers a reassuring look back; it provides the soothing certainty of the past. As a consequence, this interaction reduces the risk that the smaller cycle could leak too much of its potential and deteriorate entirely; the interactions helps avoid the exit of the smaller cycle. Instead, it eases the transition of the smaller cycle over to the growth phase, and back into its front–loop. 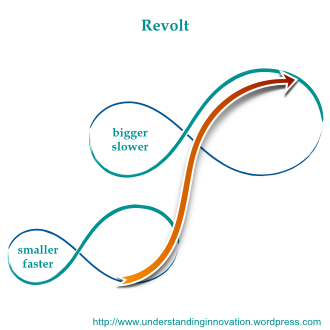 “Revolt” works in the opposite direction, from the smaller into the bigger cycle. Here, the smaller, faster cycle in its release phase, with the former order collapsing and new structures and ideas being tested. If the larger cycle is is approaching the end of its conservation phase, where resilience is low, the turmoil in the smaller cycle can cascade up into the larger cycle. In this situation, the fast experimentation in the smaller cycle can actually trigger the collapse in the bigger, slower cycle. The smaller cycle destabilises the bigger cycle, spreading upwards the uncertainty of the back–loop. In direct comparison of those two interactions, you could summarise to say that “remember” looks back to provide certainty and reassurance to the smaller cycle, whereas “revolt” looks ahead to bring uncertainty and experimentation to the bigger cycle. The different scales described so far are one thing, but let’s not forget that any complex adaptive system must handle a set of different purposes. As an example, think of a corporation. Think of it as a pretty big endeavour that delivers a range of products and services, each with their own business model (each a subsystem of the corporation). Each business model will engage with a number of different markets (different systems, external to the corporation, but affecting it, and being affected by it) and in those markets will be subject to customer demands to meet as well as regulations to comply with (yet more systems to affect and to be affected by). This corporation is entangled with many different systems that might have social, technological, economic, legal, or even humanitarian purposes; and the corporation will need to interact with those systems, and their purposes. That entanglement is the underlying reason for major surprises. We didn’t see it coming, but think of the use of social media to promote Arabellion: that’s an example for technological advances that change the political landscape. There are numerous cases of such cross-domain effects, when a change in one complex adaptive system triggered a change in the other across different scales and purposes. This somewhat conceptual and abstract consideration bears direct relevance for innovation, as it paraphrases the opportunities for innovation. Any complex adaptive system will go through periods of intense experimentation of novel ideas and approaches (the back–loop of the adaptive cycle). In these periods, the system is subject to stabilising effects from bigger cycles in their growth phase (this would be an example of sustaining innovation). And at the same time, the ongoing experimentation could trigger the release phase of bigger cycles that have gotten close to the end of their conservation phase (a case of disruptive innovation). Once again, these elements should contribute to the innovator’s situational awareness, to help him anticipate barriers to his ideas, or to identify the supporting circumstances that could push his ideas through.